Someone asked in Microsoft Community. That’s a common question for many PPT users, such as some businessmen, teachers and some individuals who are willing to show entertaining PPT on TV with a DVD player. There are indeed some useful solutions to convert PowerPoint 2007 to DVD. And you will get proper guide here to burn PowerPoint 2007 to DVD. 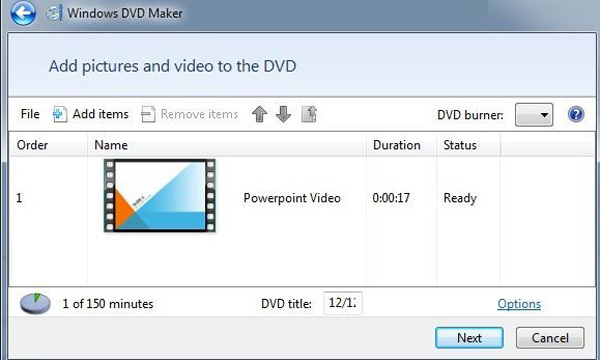 Windows DVD maker is one of the helpful and free solutions for solving the problem for converting PowerPoint 2007 to DVD. As we all know, Windows DVD Maker is available in Windows Vista, Windows 7 Home Premium and Windows 7 Ultimate, with which you can burn PowerPoint 2007 to DVD easily in several steps. You can click “File” to select “Save As”, and then choose Video format as the file type. 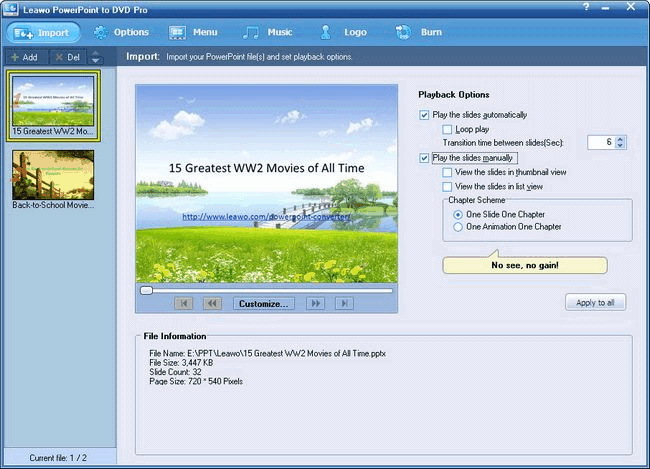 Open Windows DVD Maker to enter the interface of “Add pictures and video to the DVD”, then you click “Add items” button to import the PPT video file. You are required to insert a blank writable DVD. Then you can click “Preview” tab for Menu settings. After finishing the settings, as soon as you click “Burn”, it will begin burning PowerPoint 2007 to DVD. It is obvious that Windows DVD Maker offers you a convenient solution to burn PowerPoint 2007 to DVD. However, it has been removed since Windows 8. So it is necessary for you to get another solution for PowerPoint 2007 to DVD converting. Luckily, Leawo PowerPoint to DVD Pro will give a lot of help. Part 2: How to convert PowerPoint 2007 to DVD with Leawo PowerPoint to DVD Pro. 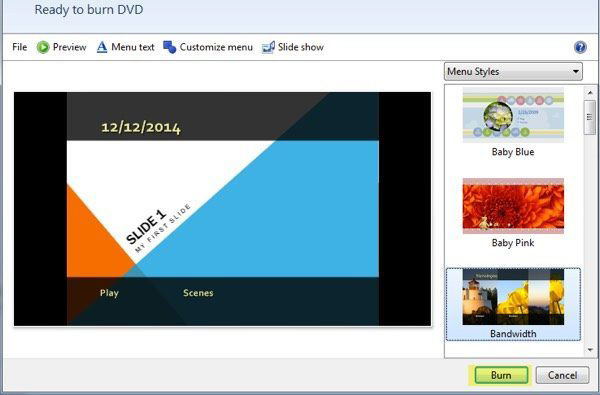 Leawo PowerPoint to DVD Pro is totally a powerful and professional program that can convert PowerPoint files to over 180 popular videos formats and burn PPT presentations to Blu-ray or DVD movies with the top-ranking technology. Furthermore, it can preserve all the original PowerPoint features including animations, transitions, sounds, video clips, etc. Besides, it can even support you to convert PowerPoint files in batch. Last but not least, Leawo PowerPoint to DVD Pro is easy for you to use for converting PowerPoint 2007 to DVD. : By the way, if your use the PowerPoint 2013 to show your presentation normally, you can also refer to this simple guide of how to convert PowerPoint 2013 to DVD to find your answer.On the following, let’s check out how to convert it. Firstly of all, you download Leawo PowerPoint to DVD Pro. And	install the program on your computer, then you could launch it and follow the steps below. Step 1: Import PowerPoint 2007 files to the program. 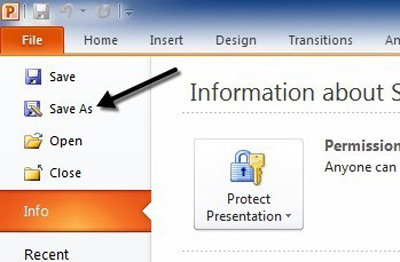 Click on the “Import” button in the menu bar and add the source PowerPoint 2007 files to the program. You can add 12 PPT files at most and then select one file to set playback options as being showed in the picture below. Click “Options” to enter the output setting panel to choose “Create Standard DVD”, and then set output Format and Folder. Note: You should choose the right options. If you are not sure about it, you can click “Help” for setting assistance. Different mode is also available here. 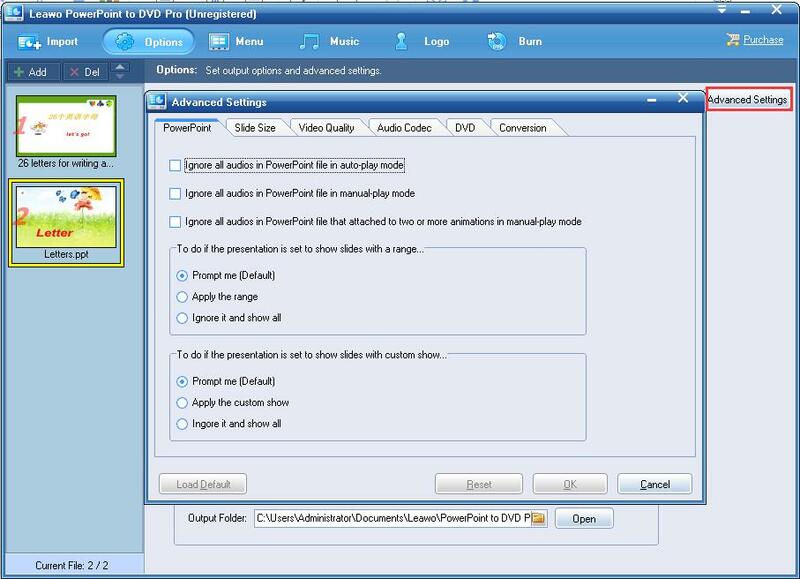 You can click “Advanced Settings” to customize the output DVD, including adjusting audio status in your PowerPoint file, size of slides, video quality, audio codec, DVD language code, DVD menu parameters, and conversion status. Click “Menu” tab to choose a proper DVD menu template or create your own. In Menu Panel, you can click “Title” to preview or edit a title menu or click “DVD Menu Creator” to create your own DVD menu. Click “Music” to add audio file as background music for your DVD file. You can choose Auto mode for adding 5 audio files for one subject or Manual mode for adding one music to every single slide. You can click on the “Logo” tab to give a watermark you prefer to output DVD and resize the output video and fill the margin with your own picture. Insert a blank DVD in your PC, then you can choose to burn PowerPoint to DVD by clicking “Start” button. And it will convert your PowerPoint presentations to DVD and then burn the output to a disc instantly. The two solutions are both helpful and effective for burning PowerPoint 2007 to DVD. And they both have their own features and advantages. You can choose the proper way to convert PowerPoint 2007 to DVD based on your demand. And here is the comparison between them, which may give you some advice. Leawo PowerPoint to DVD Pro. Menu/music/Flexible chapter schemes settings etc. Anyway, both of the solutions are great for you to burn PowerPoint 2007 to DVD. According to your condition, you can choose any one of them and make it easily.